It's natural for petals to fall off your roses when blossoms die away at the end of a bloom period. Yet if you discover your roses are continually dropping petals before the flower has completely bloomed or soon afterward, it can indicate a problem. Petals might be falling off your roses for several reasons, but once you identify the cause, you can take steps to address the issue, and therefore ensure your rose bushes are healthy and produce quality blooms all season long. Most hardy rose varieties bloom in the late spring. 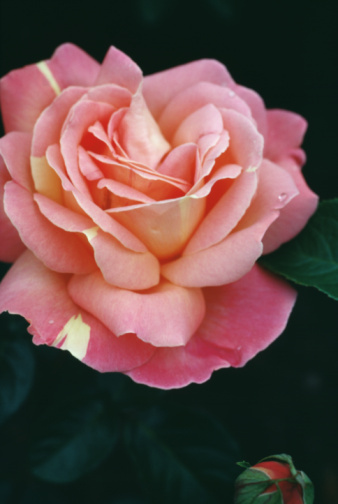 If weather conditions change rapidly from cool and damp to hot and dry, it can affect roses and cause petals to drop. Blossoms might partially open and then wilt and fall off when exposed to irregular weather patterns. All-American Rose Selections suggests providing rose bushes an additional layer of mulch and applying a potash-rich fertilizer or phosphate rock and green sand to lessen the impact of fluctuating temperatures and to fortify your rose bushes. Thrips are small insects with extended bodies that eat bud bases and petals. They prevent buds from opening, cause blooms to be misshaped as petals weaken and fall. Although they can be found on any rose bush variety, they frequently infest light-colored roses, such as white and pastels. Check the petals for yellow-brown lines and tiny dark dots or bumps to confirm the pest's presence. Prune buds affected with thrips. Apply an insecticide to the entire bush to eliminate the insect. More than one application might be required to eradicate them from your rose bush entirely. Rose midges are a pest that impacts roses. It impacts rose buds and prevents buds from opening, so they eventually brown and fall off. Look for very small white fly larvae that resemble a caterpillar near the base of the bud. Midges can also be found among petals and sepals on an infected bush. Remove and dispose of all buds infested with midges. Spray the entire rose bush with an insecticide that contains either neem or spinosad, notes the All-American Rose Selections Pest Matrix. Both of these products will effectively eliminate midges from your rose bush. Botrytis blight is a fungal disease that affects rose bush flowers. The disease generally affects rose bushes during periods of cool, damp weather. The infection thwarts buds from opening and over time the buds become brown or shadowy gray in color and petals fall. Cut off infected buds; there is no treatment for the disease. As weather conditions change and turn hot and dry, the remaining, healthy flowers should dry and eventually open. What Would Cause Knock Out Roses to Turn Brown?